All files are in mp3 format if you need a player you can download one of the best here free. Violent Fury is an intense blend of various forms of extreme music. From heavy death metal like older Deicide and Morbid Angel, to extreme forms of black metal like Immortal and Mayhem. VF hails from the Syracuse area of Central New York. The original line-up formed some ten years ago and no original members remain in the band. 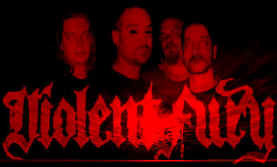 VF has played live with a variety of bands including: Deicide, Cannibal Corpse, Obituary, Fear Factory, Incantation, and Vader. There are tapes, compilation discs, and shirts available by e-mail (at bottom of page). This page is just starting to come into being, be patient, there will be much more to come!!! VF is currently working on new material that will come out as a full length in the very near future. These new songs will be combined with some older ones (re-recorded)and should come out as an 8 or 9 song cd. VF records at Audio Arts in Vestal, NY and we are quite happy with the results we've seen there so far. Book mark this page for future information. Extreme Subterranea - all the cd's you'd ever need!!! cdnow - wide variety a great prices!!! !! Praise of death Radio needs Real audio player get it below! !